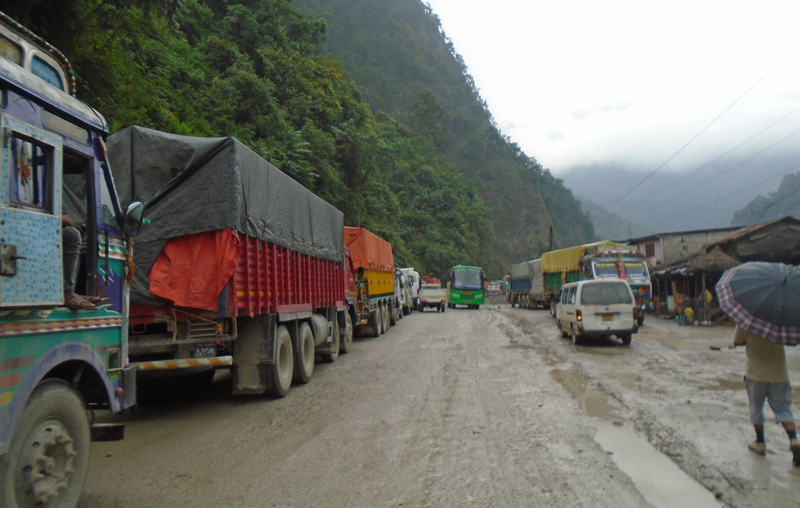 This picture provided by Narayanghat-Mugling Road Project Office shows trucks stuck in a traffic jam along the Narayanghat-Mugling road Thursday. CHITWAN, Oct 7: Thousands of vehicles passing through Mugling were stranded due to massive landslides that took place on Wednesday at Abu Khaireni, which is located just a few kilometers from Mugling. 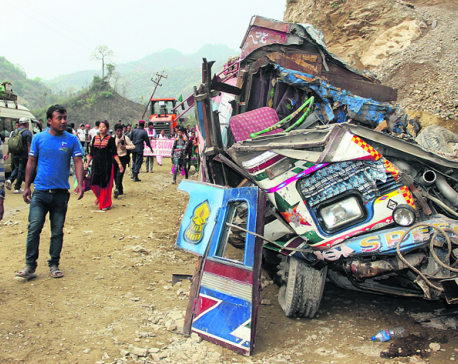 Passengers spent hours at various road sections as vehicles plying the Mugling-Narayanghat and Mugling-Pokhara route were stuck due to the debris dumped on the highway by the landslides. Although the debris were cleared from various road sections by Thursday evening, vehicles have been able to pass only through one lane at various point along the highway, according to Yogendra Hamal, police inspector at the Mugling police check post. Before the landslides, passengers had been facing traffic snarls due to the upgradation of the stretch. The authorities responsible for upgrading the highway had claimed that it would not take more than two hours to cross Narayanghat-Mugling stretch as they had sealed the potholes along the road section keeping in mind the convenience of passengers during the festival. However, the experiences of thousands of passengers heading home to celebrate Dashain are different. There was a tailback stretching up to 18 km along Narayanghat-Mugling road section earlier in the day, while queue of vehicles was 9 km from Mugling to Kurin stretch, according to the Narayan-Mugling Road Project Office. A microbus (Lu 1 Ja 2037) en route to Bhairahawa, which left Kathmandu at 7 am reached Narayanghat only at 4 pm after being stuck in a traffic jam. One of the passengers, Sundar Bhusal, said he reached Mugling at 12 pm. It took them four hours to cross the 36 km road section. Likewise, another microbus (Ba 3 Kha 8593) en route to Dang had left Kathmandu at 8 am and reached Narayanghat only at 4 pm. “The debris left by Wednesday's landslides at Abu Khaireni, which caused severe bottleneck along the road section, was cleared only on Thursday. However, rains and other problems further exacerbated the traffic problems,” said Shiva Khanal, information officer of Narayanghat-Mugling Road Project. The road section is the main route connecting the country's eastern and western parts with the capital Kathmandu. It is the busiest road section in the country even at normal times. The normal traffic of 10,000 vehicles a day has increased significantly due to the rise in vehicular movements during the Dashain. Another reason for the traffic snarls on Thursday, according to Khanal, is due to 40 heavy trucks en route to Kathmandu transporting motorcycles for various showrooms. He added that at least six vehicles broke down en route, further contributing to the traffic snarls. The Narayanghat-Mugling stretch is being upgraded to two lanes as per Asian standard. However, the upgradation works is not going smoothly, creating hassles for passengers since a very long time ago.